I promised more than one post on our camping adventure to Port St. Joe. While there's not much more to say about the park (it was lovely), I haven't mentioned anything about the food. The majority of our meals were enjoyed at camp. We grilled beer brats and steaks, made paninis and pancakes on our new Cuisinart Griddler, and ate cereal for an easy breakfast. We explored the area some with a couple trips outside the state park. Actually, before we even made it to the park, our friends (who had stayed on Cape San Blas before) pulled over on the side of the road. We followed suit. Come to find out, they stopped to pick up doughnuts from Weber's Little Donut Shop. I was able to get the last half dozen glazed they had that afternoon and was not disappointed. The donuts were perfect for a little something sweet without going overboard on the sugar. On our next venture out, Pat and I decided to explore downtown Port St. Joe. We found a couple of antique stores to browse though on Reid Avenue but weren't really in a buying mood. 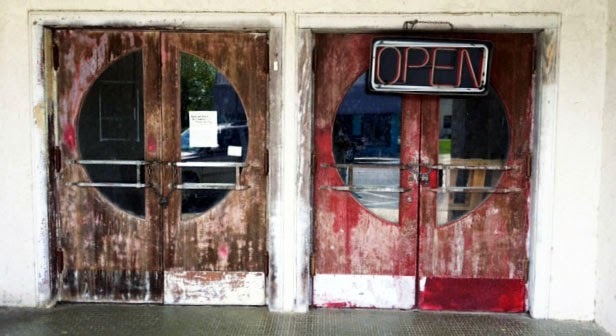 However, we were stopped in our tracks when we stumbled onto this set of doors. 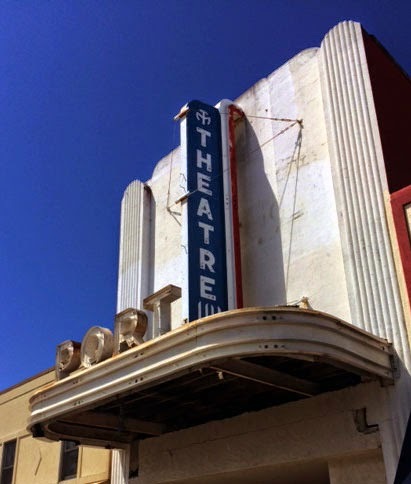 They belong to the Historic Port Theatre which opened in 1938. It didn't look like the building is currently in use, but we sure thought it was cool. After walking a good length of Reid Ave. and poking around, we were hot and hungry. Pepper's Mexican Grill was right there to give us some relief. Granted, it was a fairly standard Mexican restaurant, but the menu was extensive, the food good, and the margaritas tasty. We had no complaints at all. That evening, still a little tired from our exploring, we ventured back out for dinner. At Triple Tails Restaurant Pat and I both ordered beers from Apalachicola's Oyster City Brewing Company and some seafood. 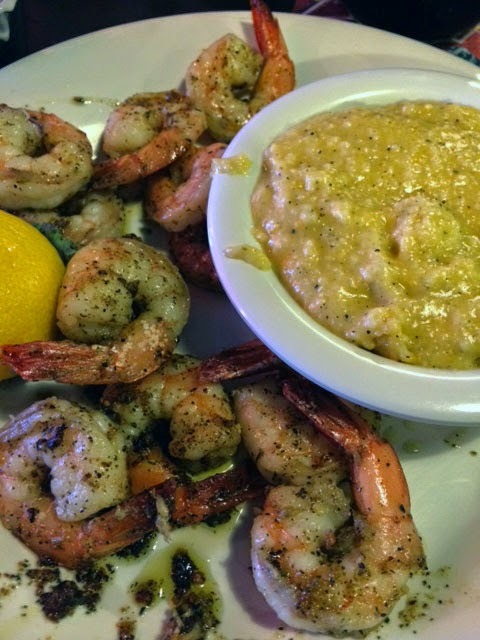 He got the grilled Mahi Mahi and fries while I opted for grilled shrimp and a side of cheese grits. Both the meals and the beers were definitely good, but I have to admit that the star of the show was the cheese grits. Pat (who isn't a huge fan of cheese grits) claimed that if all cheese grits tasted like those, he would order them all the time. I'd say that's a winning recommendation! 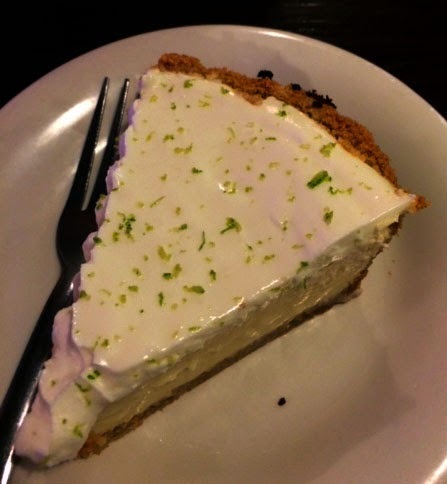 Oh, and we ordered a slice of their homemade key lime pie. It wasn't too shabby either. There wasn't a crumb left. The next morning, we awoke to darkened skies and impending rain. Not sure how long we had until storms blew through, we packed up quickly and headed out without breakfast. The Forgotten Coast is a lovely area, but it didn't seem to be bursting with breakfast joints. 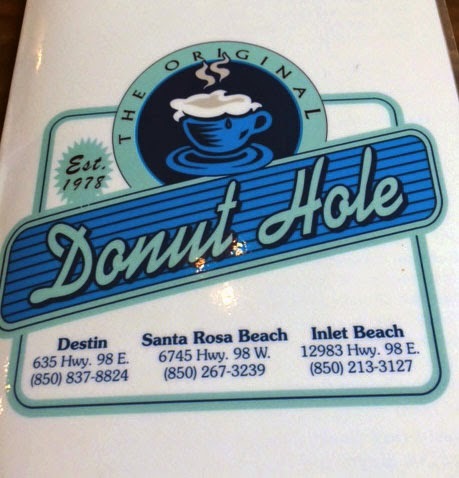 As such, we drove on to the West of Panama City to the Donut Hole in Inlet Beach. Pat and I have been to the one in Destin before and knew that it was exactly what we wanted. There was a wait to be seated and we were starving. So, I didn't get a picture of our omelets. I can tell you they were delicious and quickly consumed. We even got some donuts for the road on our way out. It was a perfect choice and a perfect way to end our trip. If you ever head along The Forgotten Coast, make sure you stop for more than the scenery. We definitely weren't disappointed with any part of our trip to the area. Yum! You are making me hungry and thirsty and wishing I was going on a fun trip! 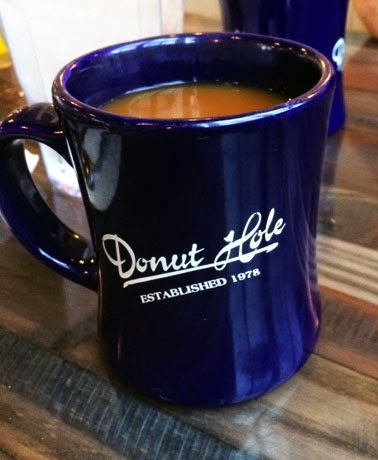 At first I thought you'd found a write up of our little donut spot and shared it...this was even better! Excellent wrap up of the good eats we found!! What a yummy post! I love key lime pie! Mmmm I could go for a slice right now. Even though I was not familiar with some of the food you described, it sounded delicious! Camping with lots of food places around sounds great!